Have you ever tried to help someone who’s overwhelmed only to have it blow up in your face? What I need as an INFJ personality type might be completely ridiculous to an ESTP (and vice versa!). 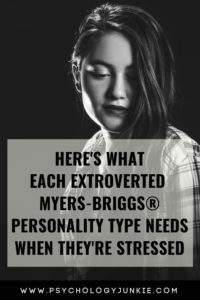 This article is going to give you some tips for understanding what each extroverted Myers-Briggs® really experiences when they are stressed and how to help them. Not being part of what’s going on. Having their brainstorming or creativity stifled. Having to conform to a predictable, repetitive routine. Not getting enough stimulation from the outside world. You may start to notice signs of stress in an ENFP when they become especially scattered and panicky. They tend to appear more “amped up” than usual and more easily irritated and sensitive. They feel that circumstances are closing in on and them and that they have no freedom or independent identity. If stress increases to extreme levels then they tend to become uncharacteristically focused on details that need fixing. They may develop “tunnel vision” related to a project they want to finish and can struggle to communicate their creative ideas. Their thinking starts to feel cloudy and hazy and it overwhelms them. As a way of dealing with it they may try to distract themselves with a nitty-gritty detailed task like sorting their filing cabinet or cleaning a drawer in their desk. Listen to them attentively and let them talk things out. Encourage their participation if they feel left out. If needed, give them space and time alone to calm down. Remind them of their strengths and tell them it’s “okay” to feel out-of-sorts. Don’t ask for details or try to offer a bunch of solutions. Speak to them kindly and compassionately. Give them permission to get away from everything for a little while. After they’ve calmed down ask if they’d like any help analyzing the situation and finding solutions. Not being involved in projects going on around them. Having their creativity and ideas ignored. Having to conform to a predictable, routine lifestyle. Not getting enough outer-world stimulation. Being pressured to make a decision or complete a task before they are ready. Having to focus for a long time on nitty-gritty mundane details. Working with incompetent or illogical people. When ENTPs first begin to experience stress they seem more distractible and panicky than usual. Their voice might be louder and they might selectively avoid people or things that they feel are imposing on them. As stress builds they start to feel inept, incompetent and frustrated at themselves because they can’t seem to regain their normal confident, innovative spirit. Creativity becomes harder and they’ll feel anxious that they can’t come up with any solutions that seem to make sense. If stress reaches an extreme level ENTPs may become uncharacteristically reserved and focus on all their failures and mistakes. They tend to develop “tunnel vision” and obsess over wrapping up nitty-gritty projects and problems that are getting in their way. They may worry about their health or start noticing physical sensations that they never noticed before. Let them have some time alone to sort things out independently. If they talk to you, listen and be encouraging and friendly. Don’t try to offer a lot of different solutions if they are extremely stressed. This will only make things worse. Give them a change of scenery. Let them walk around outside or listen to some music. Encourage them to get a little rest, drink some water or take care of other physical needs that might need tending to. Ask them if they could use any help or need to talk about it. Don’t judge them for out-of-character behavior. Feeling like life is out of control. Seeing nothing being accomplished towards their goals. Lack of appreciation for the things they do to help. Unexpected change and not having enough time to prepare. Having to focus on mundane, repetitive tasks. Having their intentions or message misunderstood. Having to conform to a plan that goes against their values. Burnout from putting others first the majority of the time. When ENFJs first begin experiencing stress they may appear more controlling of the environment than usual. They might become more demanding, angry, or withdrawn. They will try to disassociate themselves from the experience so that they can sort out the situation and protect themselves from conflicting outer emotions. Trying to keep control of things outwardly and inwardly can result in pent-up physical stress and symptoms like headaches, IBS, shoulder tension, and nausea. If stress mounts to an extreme level, ENFJs tend to become uncharacteristically harsh, critical, and aloof. They will berate themselves for their lack of clarity or the tiniest flaws. Explain why things seem out-of-control. If you’re working on a project with them, explain where you are and let them know what progress is being made. Use humor to lighten the tension (unless stress is extreme). Remind them of their contributions to the world. Don’t judge them if they seem irrational. Show solidarity with them if you can. Don’t patronize or condescend to them. Give them a change of scenery by going outside with them. Not seeing progress being made on goals or projects. Being around people who are lazy or procrastinate. Being around people who complain or are emotionally reactive. Being under the authority of someone who lacks vision. Having to engage in small talk or pointless conversations. Frustration if their directness hurts a loved one’s feelings. When ENTJs first begin to experience stress they will appear more bossy and demanding than usual. In an attempt to make progress or be productive they tend to try to take control of the situation and figure out what is going wrong or causing the inefficiency. If this fails to fix the situation then they may check out of the situation entirely to protect themselves or avoid blowing up completely. When this is happening they may busy themselves with completing small tasks just so they can feel that something, anything is getting accomplished. If stress increases to an extreme degree they tend to become uncharacteristically reclusive and absorbed in their own feelings. They may become over-sensitive about their relationships and feel misunderstood or abandoned to do all the work themselves. Help them see that progress is being made. Tell them when they can expect a project to be finished. Give them some space and time alone to sort things out. Let them vent without judging them or correcting details. Don’t act overly concerned or coddling. Bring up some ideas or solutions that might help. Having to be sedentary for too long. Having to conform to rigid rules. Having a mundane, repetitive career. Being pressured to make a decision or commitment before they’re ready. When ESFPs first begin to experience stress they will become more energetic and distractible. They will feel a restless need to find some freedom or direction and may retaliate against people who are closing in on them or restraining them. If stress builds to an extreme degree they become unusually depressed and pessimistic. They may see only the ways that things could go wrong and tend to misinterpret things people say or assume people have hidden motives or agendas. Give them a chance of scenery. Let them vent about whatever is bothering them. Be friendly and gentle in your communication with them. Listen without interrupting or providing lots of advice. Remind them of their strengths and abilities. Let them know that you appreciate them. Don’t judge them if they seem irrational or out of sorts. Feeling out of control or controlled by others. Large amounts of sedentary work. Being rushed into commitments or long-term decisions before they are ready. Being around excessively serious, uptight people. Not having enough variety in their lives. When ESTPs first start to experience stress they tend to become more outspoken and in-charge than usual, trying to take control of the situation they feel is getting out of hand. If their efforts aren’t working or they are unappreciated they can suddenly “check out” of the group and do their own thing. As stress builds they tend to become more anti-social than usual and resent other people for their incompetency. If stress mounts to an extreme degree then ESTPs can become uncharacteristically worried or depressed about the future. They tend to feel a false sense of certainty about how things will inevitably go wrong. This gloomy, disillusioned state is very unlike them. Give them space initially after the event. Let them know the reason behind whatever problem currently exists. Help them to see any work that is being done to correct the problem. If stress isn’t extreme use humor to deflate the situation. Listen to them and refrain from correcting them if they’re slightly irrational. Help them to sort out their priorities once they’ve calmed down. Give encouragement while being friendly and supportive. Not being a part of what’s going on around them. Feeling like people are questioning their motives. Not having a clear idea of what’s about to happen. Tension or confrontation in the environment. Having to conform to something that doesn’t align with their values. When ESFJs first begin to experience stress they tend to become more bossy, panicky, or scattered. They desperately want to regain order or harmony in their environment so they can wear themselves out trying to create that. As stress builds they tend to try to find security in someone or something they believe in, whether that be a friend, spouse, parent, or religious institution. If stress increases to an extreme degree they tend to become uncharacteristically critical, withdrawn, or passive-aggressive. They start noticing flaws in people’s logic and will point them out much more quickly than usual. Listen as they talk things out. Express your appreciation for what they do. Forgive uncharacteristically critical behavior or take action to separate them if they are being a detriment to others. Remind them of their skills and contributions. Don’t try to “logic” them out of stress. Remind them of similar situations they’ve overcome in the past. Let them get away from the environment that is causing them stress. Feeling like things are out of control. Not having a say in the projects going on around them. Being in a disorganized, messy environment. Having their values ignored or dismissed. Being around incompetent people or being incompetent themselves. Being in an emotionally-intense environment for long. When ESTJs first begin to experience stress they tend to become more demanding or bossy than usual. They feel like they know what needs to be done and the people around them are wasting time or being incompetent. If they feel misunderstood or that the situation isn’t being resolved they tend to become angered or cast blame at people they perceive as being responsible. If stress build to an extreme degree then they will become uncharacteristically withdrawn, troubled, and confused. They will have a hard time putting their feelings into words and will struggle understanding their emotions. They tend to “check out” of what’s going on around them and dwell on the ways they or others have failed. Give them an update on any progress related to the situation. If stress isn’t extreme, use humor to deflate the situation. Give them some time alone if their stress is moderate to extreme. Help them break a large problem or project down into bite-sized pieces. Validate their frustration and feelings. Don’t be coddling or over-sympathetic. Don’t be overly emotional in response to them if possible. Once the situation has de-escalated a bit, try to talk about some solutions that might prevent it from happening again. Did you enjoy this article? Did you disagree? Share your thoughts or insights in the comments below! It’s EXTRAverted!!! Not extroverted! If you know anything about word formation, there is no prefix “extro.” A sloppy person translated Jung’s work and misspelled extravert and now ignorant and/or sloppy people continue using the wrong wrong word. Respect Jung and use the correct word. Thank you for being conscientious!